IS have been using UniDesk for the last two years to manage your enquiries to us. Over the summer we transferred a lot of the information from our website into the UniDesk Self-Service Portal in order to make it easier to find. We’ve also transformed our content into bite-size chunks rather than lengthy web pages. We now have a massive FAQ database and lots of forms to request standard services from Library and IT. You can log in to UniDesk by following the link on the portal homepage to UniDesk. Then choose the service you want (Library or IT). Or just go straight into the FAQ database. The choice is yours. Personally, we prefer to use the inbuilt search engine which is fairly powerful and saves you the hassle of navigating the structure. check to see the progress of an enquiry you’ve asked us – go into ‘My Requests’. You can update your enquiry from there and send us documents. make standard requests – there’s a form for that! Examples of forms include: ‘Request a JISC Online Surveys account’, ‘Request a laptop/desktop rebuild’ (staff). access our massive FAQs database – hundreds of library and IT questions and answers. You can give us ratings on the usefulness of our FAQs too. give us feedback on our service – you can give us a star rating/comment after we’ve answered your enquiry. We hope you will like UniDesk Self-Service Portal. 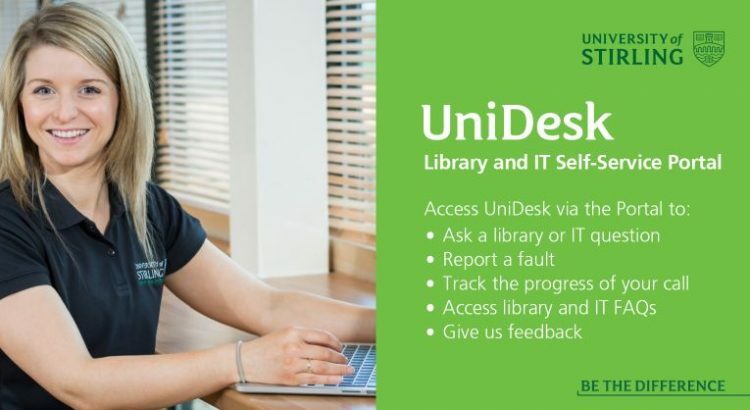 We’re very keen to get your feedback, so if you can’t find something or would like something added to UniDesk, please email us at information.centre@stir.ac.uk.